Why Choose Alike for Hyper-V Backup? Alike offers streamlined and simplified protection for all Microsoft Hyper-V backup and recovery needs. Only Alike gives you powerful Hyper-V protection with cross-platform support for Hyper-V and XenServer, all from a single installation. With Alike’s Hyper-V backup and disaster recovery solution, you get the intuitiveness and reliability of an enterprise solution without the enterprise price tag. Alike’s unrivaled global deduplication, incremental file-system awareness, and CBT technology offer powerful Hyper-V protection while saving storage space and bandwidth. Easily Scales to Fit Your Needs. Choose between agent-less or agent-based protection from the same software with our Enhanced and Q-Hybrid technologies. Get faster backups with Enhanced Changed Block Tracking (CBT). Alike’s highly intuitive web-based user interface allows you to easily manage your Hyper-V backups from any device, providing access to your data whenever you need to. Alike DR is perfect for mixed environments because it allows users to backup, replicate, and restore across Hyper-V and other supported platforms. Supporting Microsoft Hyper-V (2008 R2 – 2016) | Citrix XenServer 5.5 – 7.6 | XCP 1.0 -1.6 |. Changed Block Tracking with Enhanced backups. Backup from – and restore, or replicate to – any storage combination (local, SAN, NAS, etc.). Neutral to version, edition, and hypervisor. A comprehensive suite of backup and disaster recovery features. 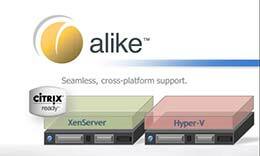 Alike is delivered by the A2 (Alike Appliance), a high performance purpose built virtual or physical backup appliance. The A2 can be run as a VM under mosts popular hypervisors, or can be installed directly onto bare metal, or as a VM. The A2 comes at no additional cost, but requires Alike licensing to function. The best way to see everything Alike DR has to offer for Hyper-V is to test it out in your environment with our no-obligation, 30-day free trial. Get your free license key and start your trial today! Learn how the industry-leading BDR software can meet all of your backup & recovery needs! Because of Alike DR's efficiency, we dramatically minimized the potential impact of a disaster for our client.